Imagine waking up on a beach after sleeping under the open sky on an island far out in the archipelago. High above you soar a pair of majestic sea eagles. The open ocean brings swells crashing on the nearby shoreline. Soon you can come along and experience this – on an all-inclusive tour. From location: Rørvik. You will be picked up at the airport or at the Coastal Express (Hurtigruten) dock (or another pre-arranged location in Rørvik). Price includes: Kayak and related equipment, tent, sleeping mat, shared equipment, search and rescue insurance, as well as experienced guides who bring along required safety gear. 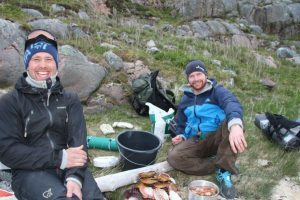 Meals during the excursion, mineral water and drinks at camp as well as transportation to and from the starting point for the trip from Rørvik and its vicinity. Price: From NOK 18,500 per person (min. 4 guests, max. 6 guests). 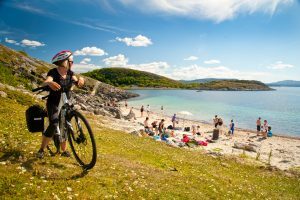 Buøy Gård, Explore Ytre Namdal and Kleiva Camping have put together the tour, NamdalNature All inclusive. We have decided to work together so we can provide visitors from far and near a complete package which includes lodging, world-class dining experiences and wonderful nature-based experiences. This tour takes you to one of the many islands in Vikna’s archipelago. 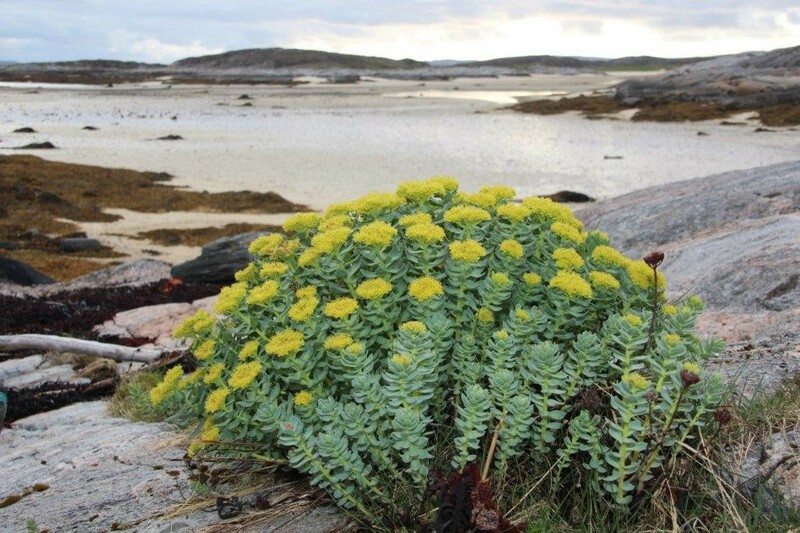 This island municipality has fully 6,000 small and larger islands. Perhaps you have heard that the municipality has Norway’s longest coastline, and that the archipelago is a paradise for sea eagle, cormorant, curlew, black guillemot, puffin, grey seal and common seal. But, have you ever had the pleasure of experiencing just how beautiful it is out there? The Vikna archipelago, indeed, the entire Namdal Coast, is breath-takingly beautiful. But, back to the tour, which is spiced up with nature-based experiences, dining adventures and active use of the archipelago in the form of sea fishing, sea rafting, kayaking among the islands, photo safaris – or whatever tickles your fancy. There are many possibilities. Tour Menu: Shall consist of some of the best local foods which the Ytre Namdal food region has to offer. Presented by one of Norway’s best restaurants. However, the most important element is the sense of togetherness that arises when a group of people are gathered on a small island far out among the archipelago. Great stories are even more enjoyable when heard around the campfire. Time passes much too quickly, and it’s easy to lose track of the hour while out there. Each new day brings new experiences in the archipelago. You’re very welcome to come and join us on this splendid tour! You are picked up at Rørvik Airport or at the Coastal Express (Hurtigruten) dock. Lodging awaits you after a day of travel upon your arrival at Kleiva Camping. You meet your hosts during the trip. 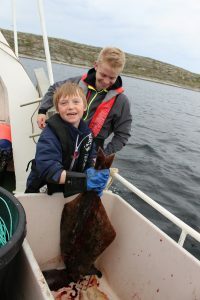 Thomas Valø from Buøy Gård and Christian Haugerøy from Explore YN will give a presentation of the tour programme and selected activities. Thomas will serve something tasty from his Local Menu. This will serve as your base for the first day/night. Kayaks and other equipment are available here. We start the day by eating breakfast together. Afterward, we store any luggage not being taken on the tour while also making preparations and packing equipment before the tour begins. The first leg starts off with about a 6-kilometre kayaking excursion from Kleiva to our “basecamp” on Ramnholmen. There, Sami-style tee-pees known as ‘Lavvo’ have been set up in advance. Baggage and equipment is transported out for us by boat. 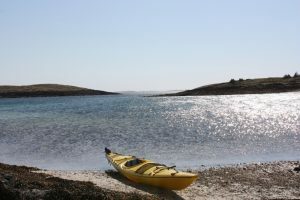 Here we get to enjoy an exciting area for kayaking in addition to having many opportunities for taking walks on shore. Our private cook, Thomas, has prepared lunch which awaits us upon arrival, and time is available after lunch for getting acquainted with the camp, a photo safari, and two activities that you selected when booking the tour, which may include: kayaking, sea fishing, diving, exploring neighbouring islands, swimming, shore fishing, etc. We get to help Thomas while he is preparing one of his specialities for Dinner. 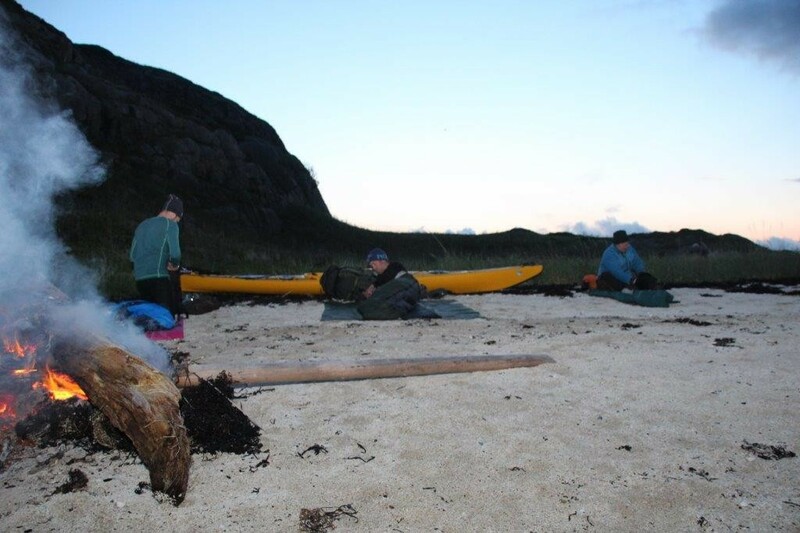 We enjoy our as a group around a warm campfire and – if we are fortunate – we will be enjoying a view of the “midnight” sun setting into the ocean at some point in the night. After waking to the sound of breaking waves and gulls crying, we enjoy a group breakfast. We then set off in Thomas’s 27-foot Anytec 750 SP equipped with a 225 HK YAMAHA outboard and capable of a top speed of 50 knots on a RIB excursion out to Sør-Gjæslingan. Here, we go on a guided tour with Christian around Sør-Gjæslingan. There will also be time to go off and do some exploring on your own. Meanwhile, Thomas has made preparations to serve Lunch before our departure. We return by boat to Ramnholmen and Basecamp. We once again get to help Thomas while he prepares one of his specialties for Dinner. 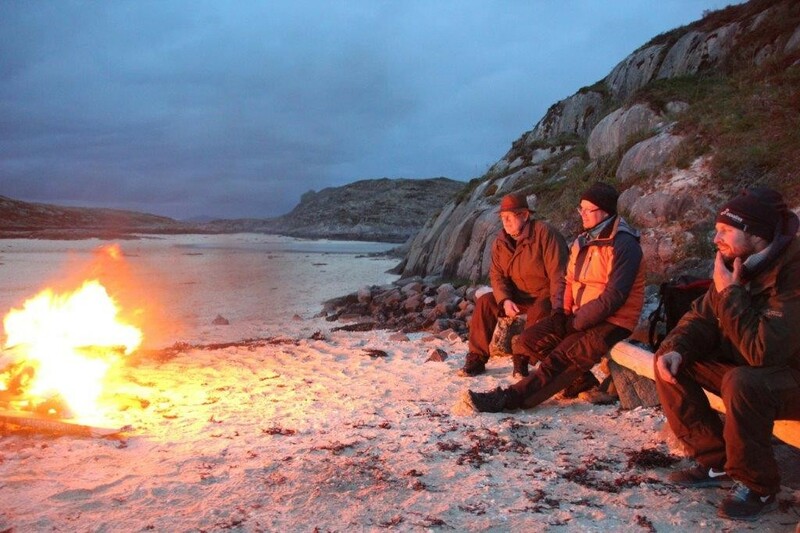 We enjoy our meal as a group around a warm campfire, and – if we are fortunate – we will be enjoying a view of the “midnight” sun setting into the ocean at some point in the night. There will be more time for pre-selected activities, which can include: kayaking, sea fishing, diving, exploring neighbouring islands, swimming, shore fishing, etc. Today, we take a trip in Thomas’s boat to Nordøyan Island where we will go walking and do a photo safari on Nordøyan. Christian guides us around the island. Lunch will be served to us at Bryggeloftet. We return by boat to Ramnholmen. This evening, we are served a multiple-course, delicious, “short-travelled” dinner. After a group breakfast, we return to Kleiva Camping by boat. Here, it will be possible to take a shower and make preparations for the trip home. Thomas prepares us a warm lunch prior to departure. • The order of days 3 and 4 can be changed. • The tour programme can be changed along the way in cases where weather and other conditions make it necessary. • The pace of the tour will be adapted to the prevailing conditions and physical conditioning of the participants. Christian is an experienced kayaker and course instructor. Both Christian and Thomas are certified Boat Drivers with the D5L class certificate for leisure boat skippers, and they will always consider the needs of the group and give safety top priority. In the event we experience harsh weather, the area is also ideally suited for fantastic walking tours.